I'm super excited for the new version of the Flash Cards and am designing a case to hold the console and carts; I want to have a separate cart for Breeder and development, so my husband whipped up a couple of prototypes for custom shells, that way we won't have to cannibalize any OEM carts' shells. He took measurements last night of all the critical dimensions of the model MIN-002 for this initial draft as a test fit, and I'm happy to say that it fits perfectly and even engages the lock latch! The inside is solid for now because we need a 3D model of the new board (hopefully in .STEP or .IGES, though we can make do with good head-on photos of the top/back/side with a ruler for scale), or we'll sit tight and wait for a physical copy. Anyway, the idea with this prototype was to have a live hinge on the crown so it could be cast in one piece, then folded over with the card sandwiched inside. There aren't any spaces for the screws, nor the data cable, as of yet. We discovered that the plastic shelf on the MIN-002 wasn't actually necessary; we suspect it was primarily meant to give a flat space for the label, and/or covering the pins because this was likely marketed at a demographic younger than that of the gameboy. Kid grime, amirite? 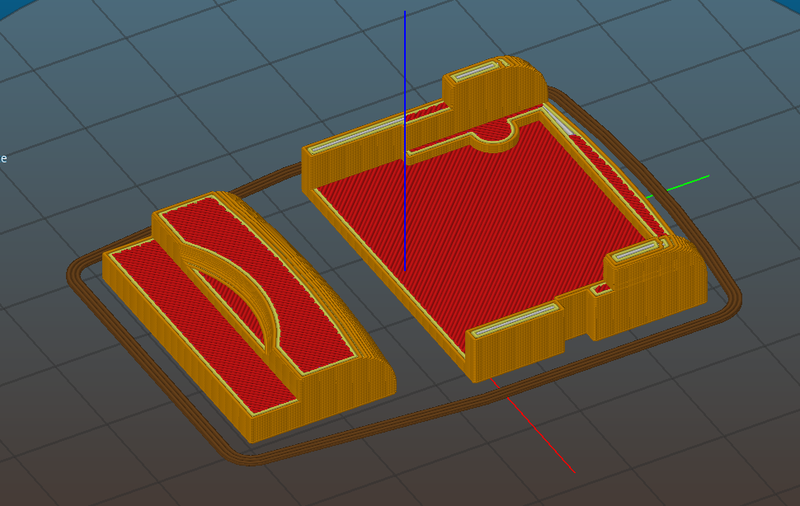 That said, we're trying a design which exposes the contacts, just like the DS family of carts does, which is extra appealing because it allows ease of access for cleaning said contacts. The MIN-002 carts have a surprisingly complex interlocking structure that that is prohibitive for casting in the small homebrew quantities we're doing, albeit incredibly clever. We also suspect that, while being manufactured in Japan, the design may have been developed in Redmond because all of the critical measurements are in imperial rather than metric. Wow, this is great work. I will just say that the flash cart will hopefully be shipping with label stickers the same dimensions as the standard ones, which would most likely not work with your custom design. Would you consider doing a curved bottom design as well? When you talk about the hinge, do you mean at the very top of the cartridge? I can see potential issues if it's in the center as I believe that's where the flasher plug will be (for those that want to make a hole for easy access to quickly re-flash). Oh, good to know! We'll see what we can do, but worst case secnario we can put a recessed pocket in the backs that'll fit the stickers. The current iteration has holes for screws on the back, and I just measured it and found that there's juuuuuust enough space for it there without interfering with the holes. Yup, good point! 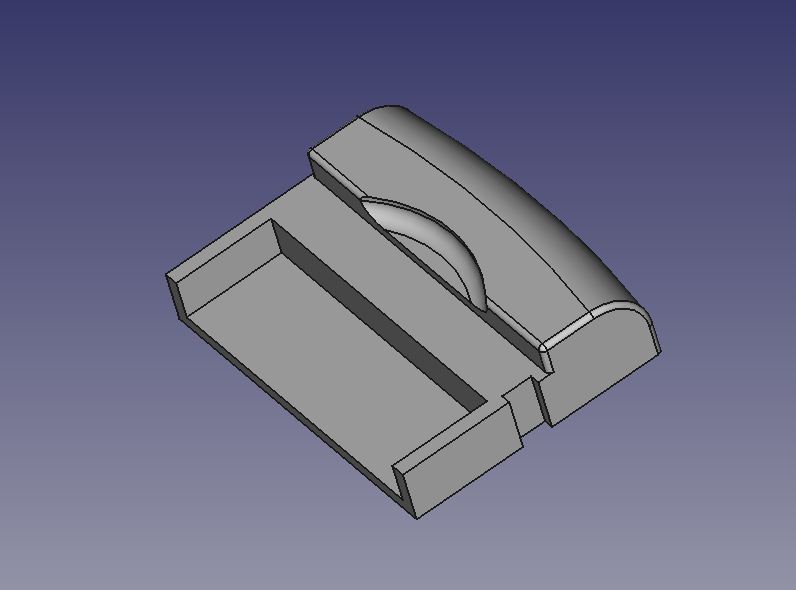 We're ditching the live hinge and trying a two-piece with screws, though we've thought about doing clips so it'll snap together, but it might prove too troublesome to cast, so screws look like the way to go. Really cool work, sign me up for one! TiredKorok wrote: Really cool work, sign me up for one! Got a print of the two-part shell's general shape. It still needs screw holes and the port for the programming cable, but it does fit the board and the console. We'll make a few tweaks before making a final version that's smoothed out, but we already have the casting materials ready for the final version. The latest version looks very nice! I like it!